It’s not uncommon for homeowners to feel their kitchen could use a little more elbow room. 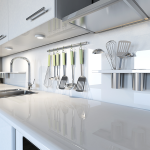 Even a relatively roomy kitchen can start to feel cluttered and cramped if your cabinets and counter space don’t feel equal to housing the things you need to store while giving you enough room to cook. Fortunately, there are some easy ways to make the most of the space you have. Add shelves: Open shelves on an unused wall or the end of a cabinet can hold cookbooks, dishes, or other items. Install a magnetic knife rack: Store your knives within easy reach while ditching the counter-hogging knife block. Rethink appliances: Install a microwave/hood combination to save space. In general, if you are not using an appliance every day, stash it in a cabinet and only take it out when you need it. Go high: If you have space above your cabinets, that can be the perfect place to put items that are used less often, such as baskets or serving bowls. Invest in drawer organizers: A chaotic tangle of utensils isn’t just frustrating when you need to find something, it can also eat up your drawer space. A set of organizers will help keep things neatly and compactly in place. Add shelves: Free-standing shelves inside the cabinets can help you double up your storage space by creating extra room for small items without having to stack them directly on top of each other. Use the doors: Inside a cabinet door can be a great space to add hooks to hang small items such as measuring cups. Reclaim the corners: Corner cabinets are a notorious location for wasted space. Installing a lazy susan or specially made drawers to take advantage of that corner space will reclaim wasted volume in your cabinets. Stash the trash: A slide-out cabinet for trash and recycling will get the bins neatly off the floor and discreetly out of sight. Hide the seating: If you have a breakfast bar or island, get stools that can slide all the way under the counter. When they’re not in use, they’ll be out of sight and out of the way. Downsize the table: If you have a kitchen table, consider getting a smaller one, perhaps with a fold-down leaf if you sometimes need room for a larger crowd. Smart design can make even a small kitchen seem spacious. For more advice on how to make every inch of your kitchen work for you, consult the design experts at Sea Pointe Construction today. Do High-End Appliances Raise Home Value?